1Ph.D. DST-National Post-Doctoral Fellow, Herbal and Indian Medicine Research Laboratory, Central Research Facility, Sri Ramachandra University, Porur, Chennai-600116, Tamil Nadu, INDIA. 2Ph.D Scholar, Herbal and Indian Medicine Research Laboratory, Central Research Facility, Sri Ramachandra University, Chennai-600116, Tamil INDIA. 3Ph.D., Professor (Research), Central Research Facility, Sri Ramachandra University, Chennai-600 116, Tamil Nadu. INDIA. 4Ph.D., M.D., D.Sc. Professor of Eminence & Dean (Research), Central Research Facility, Sri Ramachandra University, Chennai-600116, Tamil Nadu, INDIA. Introduction: Complex natural products are emerging as a potent alternate and complement in anticancer therapies due to its multiple mechanisms of action and minimal effects on nontarget cells/tissues. Some of the traditional herbal formulations contain Plumbago zeylanica L, (commonly known as Chitraka or Chitramoolam) to treat various disorders for centuries in Africa and Asia. 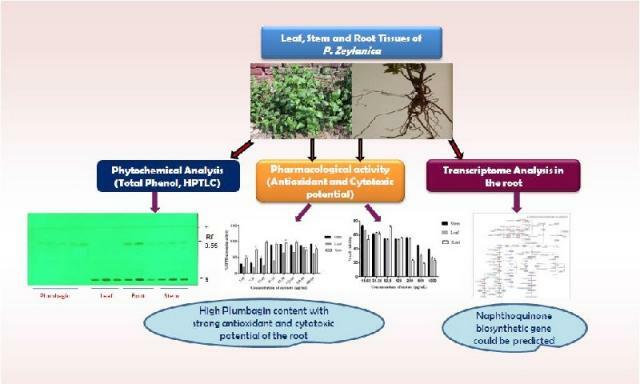 Methods: The quantity of Plumbagin was detected in different tissues of P. zeylanica through HPTLC analysis. We evaluated and compared the alcoholic tissue extracts of leaf, stem and root of P. zeylanica with standard pure Plumbagin for its in vitro cytotoxic effects (metabolic viability; MTT assay) in A549 Lung cancer cells and antioxidant potential (DPPH free radical scavenging and total phenol content). RNA sequencing and transcriptome analysis was performed in the most potent tissues of P. zeylanica demonstrating efficient pharmacological activity. Results: The root extract containing 1.3% of plumbagin exhibited strongest scavenging potential with 50% radical scavenging (IC50 value of 3.99 μg) in comparison with 35.85 μg in stem (0.2% Plumbagin) and 18.06 μg in leaf with 0.00007% Plumbagin. The in vitro cytotoxicity in A549 cells also showed that the root extract was most potent with an IC50 value of 164.5 μg as compared to extracts from stem (IC50= 379.5μg) and leaf (IC50= 274.9 μg). Conclusion: The strong antioxidant potential shown by the P. zeylanica extract demonstrates its ability to protect the non-target (normal) cells against oxidative stress, while the cytotoxic effects suggest that it could inhibit the growth of cancerous cells. Further, transcriptome analysis predicted the expression of potent gene transcripts coding for quinone biosynthesis in the root tissues of P. zeylanica. ‹ Pharmacognostical and Physico-chemical Standardization of Euphorbia neriifolia Leaves. Sundari BK, Telapolu S, S B,, Thyagarajan S. Cytotoxic and Antioxidant Effects in Various Tissue Extracts of Plumbago zeylanica: Implications for Anticancer Potential. Pharmacognosy Journal. 2017;9(5):706-712.